Welcome to the final post in my fifth-annual Goal Setting Series! Each year, I am left in awe of the leaps of faith you take as we go through this process together, and this year tops them all! I am reading every single comment and am so excited for your year ahead. You are making meaningful powerful progress! You are on fire! If you are just joining, it’s never too late to begin and you aren’t “behind” one bit. Now is the best time to get started. Dig in! 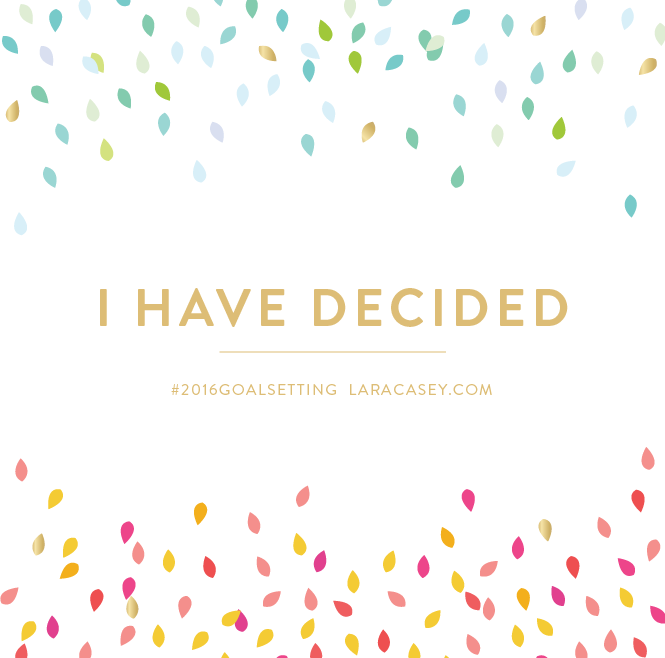 2016 Goal Setting, Part 1: What Worked and Where to Start! Okay, let’s do some dreaming together! Imagine it: the end of 2016. The weather gets colder, December 2016 rolls around, and you start looking back at the year you’ve just lived. What would it take for you to look back and know that you lived on purpose instead of by accident? Knowing where you want to be at the end of 2016, what do you need to cultivate today? Literally today. However many hours or minutes are left as you read this (even if you are reading this in bed), how can you make one small decision in the right direction? My friend Lysa says that every decision we make has an arrow attached to it, pointing us in one direction or another. Your decisions have the power to fly through all the distractions and fear and aim for a clear target, OR they can float around and miss the goal. I want my decision arrows aimed right at Jesus. So, today, I made some decisions and finished my 2016 PowerSheets Goal Setting process. The goals I’m about to share with you may seem simple, but they are boldest scariest goals I’ve ever written. They are coming from a place of restlessness, knowing I’m not using all of my potential yet, but also knowing that the impossible is possible. I have great hope in these goals. My goals are “simple” and that’s leaving lots of room for God to change everything on my path. And you know what? His plans have always been better than mine. I’m up for it. I’m leaning into the mess and the unknown. I’m willing to let go and not be perfect. I’m willing to sit in the restlessness and un-rushed pace of the little by little to get to the end of this year knowing I lived on purpose. Making hard and powerful decisions with focused arrows attached to them will be worth it. The tending and watering and waiting and getting messy and growing pains will be worth it to get to the flourishing harvest at the end! Maybe you are feeling the same hesitation-scary-I’mALLin feeling with me right this second! Let’s choose a new way through the fear together. I’m choosing faith over my fear and I invite you to take the leap with me. Let’s cultivate the faith part, little by little, and the fear part will dry up. We’re not going to fertilize the fear this year, friend! Are you with me? Like I said in my first post, you can’t do it all and do it well. Here’s what’s on my mind right now: Two sick babes (one sleeping here on my lap! ), 70,000 words to finish in 7 weeks, a family group to encourage, a team of women to lead, a new baby coming in 7 weeks on February 26th (!!!) and so much unknown in adoption and all that is ahead, a home study to renew (since we’ve been in the wait for over a year, it expired), a house to prepare for a new baby, maternity leave to prep for, a business that’s about to go through a major transition period with new employees to train (one flying here on Monday!) and two going on maternity leave (Emily and me), and well… a lot of emotions about all of this. I know I cannot do all the things in front of me well. I have to decide what to focus on and let go of the rest. I have to surrender and trust. Can you see my white flag waving from where you are? Because it’s flying high. I surrender, and I’m making decisions today to flourish in this year ahead. At the end of 2016, I won’t regret these arrows I’m sending direct to the target! I said YES today to trusting that my team is equipped and ready for this season of Emily and I being out. They are incredible, capable, inspiring, magic-filled women. I am so grateful. I’m saying YES to building Ari up this year in his faith and loving him well. I’m saying yes to the year of monthly date nights that I gifted the ladies in my office, and committed to enjoying with Ari too! There’s more, and this post is so “undone” but, our adoption case manager just called and it was another reminder to choosing purpose over perfect right now. My decision arrows are cutting through all the things to get to THE thing I need to do right now: write the words He has given me. A sneak peek. The book is called, Cultivate: A Grace-filled Guide to an Intentional Life. It’s a guide to embracing imperfect progress and making what matters happen, little by little. It’s a book about flourishing in life and goal gardening. I’ve never been so excited to write. I’m so ready! I just paused in writing this to go downstairs and hug Gracie. I found a package in the kitchen with this inside from my friend Erin: a 2016 calendar full of blooms and seed packets. Oh my soul! Y’all. I’m crying typing this. Erin, I love you friend! YES to filling the pages of this calendar with flourishing faith, family, and imperfect progress this year. Yes to planting meaningful seeds today that will grow and bloom with time and tending! A little of Erin’s story: Years ago she left the hustle and bustle of city life to pursue a slower, simpler and more intentional lifestyle. She and her family dreamed of eating fresh vegetables from their garden, tending a flock of chickens and planting a small orchard. Shortly after they moved in, a generous neighbor brought his tractor over and tilled up a new plot of ground so that she could plant a garden. “Tucked among the many vegetables in that early garden was a double row of flowering sweet peas planted in honor of my great grandmother. Grammy had introduced me to gardening and flowers at a very young age. As a child, I was her “little flower girl” and she tasked me with making bouquets for her bedside table. While my creations were far from beautiful, she always cooed over them as if they were the most precious things on earth. Flowers were a source of great joy and connection between us. So, when the first flush of sweet peas bloomed in our new garden, it felt as if she were there with me. I shared much of the gardens bounty with friends, family and anyone who crossed my path. During that abundant season, word got out and someone ordered a jar of flowers for a friend. I’ll never forget that day as I nervously knocked on her door and awkwardly thrust the bouquet into her hands. Surprised, she buried her face in the flowers and tears immediately welled up in her eyes. She was instantly transported back to her own childhood summers, to a time of great happiness and to her own grandmother’s garden… right then and there I knew I had found my calling.” Isn’t her story encouraging!? Erin inspires me to dig in, take the leap, and live on purpose! Goal 1: Study the Word. Why? To know the true God. This is the way to everything good—in marriage, business, health, friendships, motherhood, all of life. THIS is the way to lead and love well and to get to where I want to be when I’m 80. The positive effect taking action on this goal may have on my life and others: I will transform. How I will feel at the end of this year having made progress on this goal: ALIVE! I will not regret the time I took to do this! Pray about and decide on a study plan. I’m thinking I will study the Old Testament this year and the NT in 2017, but it may take longer to study through the OT. Use a spiral bound notebook and open it on my desk with an open Bible and a pen ready. Use Jen Wilkin’s method of studying scripture, as well as Jane’s. Use my Write the Word journals daily. Use a journaling Bible to get creative in the Word and be inspired by the Illustrated Faith community. Have a bag ready with a pen and Bible inside to be able to take my studying on the go. Set up my desk to be a place of studying the Word as my main focus – open Bible and materials. Invite Gracie to join me and set up supplies (colorful paper, Bible, pens) for her too!- DONE! I made her a drawer in my desk with paper, pens, and a little Bible. Write this sign to post on my desk: A year of sprouting under the soil, breaking free and letting go of my outer shell, and soaking up nutrients in order to bloom! – DONE! How I will know I accomplished this goal: By the fruit of my life (But the fruit of the Spirit is love, joy, peace, patience, kindness, goodness, faithfulness, gentleness, self-control – Gal 5:22-23) having chosen to study the Word more than I study the world. How I will celebrate at the end of 2016: Anyone have ideas here? I am not sure! Why? To meet and be transformed and INFORMED by God. The positive effect taking action on this goal may have on my life and others: I will live a peace-filled un-rushed life, and be able to make wise decisions. How I will feel at the end of this year having made progress on this goal: Connected. Peaceful. Joyful. Taken care of. Whole! Take everything off my office walls down. – DONE! Ask God what to do next and what prayers to put on the walls. – DONE! Write the prayers on colorful paper to put on the walls, and write prayers in my VMP Prayer Journal. – DONE! Get on my knees here in my “war room” and talk to God! – DONE! Write family prayers on the kitchen bulletin board. Pray with Grace at night before bed. – DONE last night! Continue to pray with Ari every morning before work and at meals and whenever we feel God tell us to! – DONE this morning! What helps you to pray? I’d love to know! Ideas are welcome! How I will know I accomplished this goal: By the fruit of my life (But the fruit of the Spirit is love, joy, peace, patience, kindness, goodness, faithfulness, gentleness, self-control – Gal 5:22-23) having chosen to pray and talk to God more than I seek approval or comfort from the world. How I will celebrate at the end of 2016: I will paint my answered prayers on Christmas Day on a big canvas for our living room with Grace. I already have the canvas. I’m teary-eyed thinking about this! I just let out a sign of relief. How these goals will play out over the next 12 months will be more specific as I do my monthly PowerSheets pages, but I am so grateful for this process and clarity! I know where I’m going. Lead team WELL and cultivate a culture of WELL. Write Cultivate in January and February and release well in December. Start a movement of making a mess and embracing imperfect progress. Goal setting with open hands. Prepare for and enjoy a joyful adoption maternity leave. Hand off company finances and back-end business this year so I can transition to a part-time role, focusing on writing and big-picture creativity. Lead teaching on new PowerSheets site to help people make meaningful life goals happen and embrace imperfect progress. Create meaningful small collection of shop products. Write and release Couples PowerSheets. Create meaningful new 2017 PowerSheets. Create meaningful Write The Word content throughout the year. Meaningful speaking and teaching through MTH and online conferences. Lead big picture team vision and mission-centered decisions. End the year knowing we lived and created from filled wells, and experienced beautiful team unity doing the good work we were given to do. Whether you came up with two goals or twenty, I hope you feel more focused on what matters most having done each step alongside me! I am excited to check in with you here on the blog throughout the year to see how you are doing and encourage you. Tell me in the comments: what are your 2016 goals? Lastly, thank you! Thank you for joining me on this journey. I am still going to be reading every blog comment here and cheering you on. Taking this little by little has been worth it and I am praying you find the same is true for you. Choose to focus on progress—little by little progress—not perfection. Your seemingly small steps forward today will add up, and a year from now, you will be so grateful you started today! Get messy and make it happen, friend! Comment with your answers from each step as we go through this series and enter to win these goodies via the Rafflecopter box at the bottom. One person who comments with answers to every step in this series will win a bonus prize: A (spiral bound) One-Year PowerSheets Workbook. I’m determined to motive you to dig in with me on these powerful steps! 4. The Make it Happen audio book, recorded by yours truly! 8. Two tubs of Vega Protein and Greens + a Vega shaker cup. Bonus: sign up for a free Vega account to get $15, and I’ll get $15 too! 10. ARE YOU READY FOR THIS?! 10 2016 Simplified Planners (pineapple daily edition). Yes, TEN of them! Lots of chances to win! – (Not pictured, but so fun!) $25 Amazon gift card for books. Some suggestions: Anything, RestlessEdit, The Best YesEdit, A Confident Heart, The Fringe Hours, or anything on Nancy Ray’s Book Club list. 14. The Write the Word journal collection – volume 1, 2, and 3! 21. Amazon Gift Card: Jessica P.
Please email Stephanie – [email protected] with your mailing address and she will get your goodies to you! : ) Congrats, everyone! P.S. The e-book of Make It Happen is on sale for 3.99 this week only! Get it here! 1. Grab a copy of my book, Make it Happen. 3. Join me in person for the Making Things Happen Conference in March. See you there! We might be 5 days into 2016 but working on my goals now! And one of them includes reading a list of books including Make It Happen! Thank you so much for your blog posts and periscopes! I am just coming back to my faith and can’t explain with words how encouraging you have been. I’ve read your book and I’m working on my power sheets and discovering some amazing truths that were hard to write. I’m excited and a little (or a lot) scared about what’s to come. But mostly, I am thankful. I was lost not that long ago and now I feel found. Amen! This is so encouraging Megan!!!! I love your 2 goals, Lara. I worked on my goals this afternoon, and my first one was To delight in God’s work and His character and rest in his delight in me. And then I just stopped and realized that that could be my only goal for the year and that would be okay. I did go on to write 8 other goals, but maybe they are more like action steps and things to stay focused on to live on purpose, but that first one is really all that matters. Yes!! I love it, Cathy! I am inviting a friend and asking my mom to go through this with me! Thanks for writing this! I love the download and it helps to write it all out. My word is still love! I am excited about what this year can bring. My goals also include reading the Bible and prayer and I have my action plan ready! I also want to develop more friendships. It seems I am always just rushing thru life trying to make it to the next day, but this year I plan on stopping and taking more time to care about family and friends. First, thank you Lara for taking the time to write these wonderful blog posts! This series has been amazing! My goals are few, but are ones that I feel are big in my life right now. Of course I have many, many things that I would like to accomplish but I’m focusing on two. 1. To become a better ME: regain my patience; stop yelling & being rushed. Enjoy the craziness that fills my days. 2. To reach nonprofit status with my childhood cancer organization named in memory of my sweet angel Alexa. Today I encouraged my best friend, and fellow childhood cancer awarenews warrior. We are both training to run part of a 55k to help raise money for Wolfson’s Children’s Hospital in FL. Neither one of us are avI’d runners, and it was difficult, but we made it through day one! We talked about out girls, (my daughter & her niece) who both passed away after battling brain cancer. That alone was our motivation not to quit. Their memories encouraged us both! My word for 2016 is “progress.” No matter how small a step I take as long as it is in a positive direction it is “progress.” I am very excited to be a better, more loving, calm, faithful, progress filled woman by the end of 2016. Thank you Lara. My 2 main goals for 20 16 are to be intentional in all things, and to honor my husband with my thoughts, words and actions. I really believe that by focusing on these 2 things all year, other areas of life will follow and fall into place. My word for 2016 is INTENTION, and by focusing on that throughout my day and in all of my choices I KNOW I can keep my goals top of mind (and heart!). Christina, these are two of my goals as well! I’m hoping to be continually thinking of my word – Intention – before all of my words, actions, and choices. I have several other goals, but they all really direct me back to these two and being intentional! Thank you Lara -your such an inspiration. I’ve written two business focus goals so far, but I’m feeling the tug to write a goal about faith. But honestly am scared to write it. I’ve never been a religious person. I wouldn’t even know where to start. I keep saying next year I’ll check out a church, or something. I’ll keep plugging away on my goals & see what happens. I was excited to read a couples Powersheet in the works, I would love that! I loved this – my goals focus around cultivating love – love for God, myself, my family, friendship and the world I influence. Lara, Your goals are inspiring! It is so apparent that through these two goals, all other pieces of life will fall into place. My goals are:1. Be intentional in my relationships, actions, choices, and thoughts. 2. Study the Word and cultivate prayer. 3. Read 15+ purposeful and enjoyable books. 4. Simplify. Save money and accumulate less clutter. 5. Cultivate a thriving and strong marriage. 6. Be strong and healthy and create that environment for my family. 7. Be creative! I cannot wait until your next book is released, I am so excited to read all that you’ve been writing! Wow I love that! Adding it to my list! Thank you! Thank you for opening up about this process. At this moment I have no idea what my goals are, just about every area of my life is unknown. As a newlywed it’s a little unsettling. It has helped to begin digging deep with an open heart before setting goals. One suggestion for reaching your Study the Word goal is to give away Bibles! Whatever number God puts on your heart. Thank you for sharing, Lara. Many blessings to you and your family this year. Such a great idea! And I just prayed for you in the unknown. God is with you! I left a comment with my goals on last post, but I wanted to leave another here for accountability to myself. I want to invest in my marriage, be a present mama to my son, put down my phone more, and actively seek God! Oh Lara, I’m praying for you and your (growing) family. This is the year of only a couple of goals for me but ones that are large and transformational too… like learning to be a mother and be intentional about family time. Hugs friend!! I can’t wait to “meet” your newest little girl! Our babe’s “guess date” is the 18th of February and my 30th bday is on the 27th! It’s a great month :). I’m so excited for you friend! What a great month, indeed!! Today I encouraged a friend to reevaluate a work situation that leaves her stressed and feeling ill a lot. I started keeping up with you when I was getting married because I love your magazine. The last time I checked you just had Gracie. My life got busy; I had a baby, sold a house, bought a house, started a new job, and completed grad school. Needless to say everything has been a blur. I had some free time during the holiday and I’m like I wonder how Lara Casey is doing. You just popped in my head and I kept googling Lauren Casey and nothing came up, of course lol. I’m like oh man she doesn’t blog anymore. Then I see Lara Casey and I am so excited to see your face and your red hair! I’m like OMG she had another baby, and she’s adopting and she wrote a book and she has a whole movement now! I kept seeing power sheets and I’m like I need these in my life! Your 2016 power sheets were sold out but I bought the 2015 and couldn’t wait to get started. I bought them to work today to show two coworkers and one already went and ordered them and the other is like OMG Lara Casey’s power sheets!! She already knew who you were and showed me she follows you on instagram. She said she loves your handwriting and all your quotes so I gave her my postcard and she was so delighted and put it on her desk. I don’t know what made me think of you over the holidays but I did and I am so glad. It seemed as though it was just a calling to you, to hear your story and get the motivation and inspiration I needed. I started my power sheets and it’s just so freeing to think, plan and wanting to grow! After I had my son I remembered your post about postpartum depression and I’m like she just writes her heart out and I can feel your connection. I still feel that way and so excited to be on this goal setting journey! Thank you for your inspiration and encouragement. I’m so happy for you and your family and wish you peace, patience, and love with three little ones this year, and especially a smooth delivery for the mother and baby. You are such a blessing and touch so many people. My word for 2016 is NURTURE. I’ve been working through your Powersheets and being reminded of how abundantly blessed I am. My goals will be centered on nurturing my blessings, including my beautiful marriage, my testimony of Jesus Christ, my friendships, my program of research (on HOPE! ), my artistic talents, and my home. Thank you, sweet Lara, for sharing this “digging deep” process with us! You are a blessing in my life (and so many others lives!). I carved out a little time to work on powersheets before work & the goals just flowed but “only three” & I prayed on it then recalled “comparison is the thief of joy’ & called it done with the idea to add on whenever moved to do so. Seeing your two goals, I realize it’s the ‘ol quality not quantity. Thank you for reaffirming me & best of luck with writing. I cannot wait to add cultivate to my wish list for next holiday season! I try to help my friends achieve their goals everyday. I am blessed to have friends with goals! I really enjoyed reading this! The message is amazing, and really makes you think alot. Adoption is near and dear to my heart. My brother was adopted from South Korea in 2006 and it is an honor and a joy to be part of his forever family. I pray adoption would be a picture to your sweet family of the incredible gift of grace and acceptance we have been given in Christ! I don’t have the “traditional” journaling Bible that I see so frequently with Illustrated Faith, but I LOVE mine. It’s from Zondervan, and the right side of every page is blank. Highly recommend! Also love and recommend Watermark Community Church (Dallas)’s “Join the Journey” app. Last year it walked through the entire Bible, but this year is slowing down to study just the Gospels. Tiny fragments each day to spend time poring over and studying intentionally and deeply. I want to buy ALL of those resources you listed–thank you for sharing! Many, many blessings to you in 2016, friend! Thankful for your ministry and your willingness to share your heart. Happy new year! AHH! This may sound like the dorkiest thing ever, but I have the very same 2 goals as my 1&2! To PRAY and to STUDY God’s Word (…and I ordered Jen Wilkin’s book 2 weeks ago after a recommendation from my sister!) As I’ve gone along, I added 3 more…. Thank you Lara for your encouragement! I’m always humbled when you share that you begin all of your Powersheets time on your knees in prayer – yay!! Today I encouraged a dear friend who is in the midst of a divorce & is now being summoned to testify in her ex husband’s girlfriends divorce. It’s been one heck of a year for her, and she is extremely nervous and stressed. I reminded her that she has been such a great example o strength for her children this past year, and that will certainly carry her through these next few days. One thing that helps me pray is to write it down in my planner…I usually will make a list of people or things that keep coming across my mind…I try to intentionally take note of those people or things are on my heart. If I don’t have time right away (work etc.) to really commit to praying I will jot it down in that little planner so that at the end of the day when I have more time and usually a little quieter time, I am reminded and won’t forget them. I also tend to hold myself accountable more when I put any to do tasks or prayers in my planner. I’ve been chasing the perfect mom. The mom who cooks and cleans and packs your lunch, kisses you goodnight and makes your bed for you. I’ve been chasing after what other moms do! I’m chasing approval and acceptance from my mom, my dad, my step mom. I’m chasing approval from school, my teachers, my peers, and collages. I’m chasing the perfect GPA, which is pointless, because it will never be perfect. And then gets me down… because I want it to be perfect. I want it all to be perfect. I’m chasing the perfect room design and furniture. I’m chasing towards a pretty house and a garden (I don’t even like gardening!). I’m chasing toward a perfect backpack, the perfect notebooks, perfect pens, the perfect outfit. I want to look the best, be the best, preform the best. And I know it’s impossible, and that makes me sad, because I want it. I want to be perfect.I’m chasing a perfect life. I’m absolutely terrified about finals. I am worried that all this goal stuff isn’t going to work, that I will have wasted my money because I’m at the point of no return. I hoping so much that this will work, because I don’t know what else will. I’m feeling overwhelmed by all the homework I’m not doing right now, and by waking up tomorrow morning just to go to school and get more. I’m feeling scared that my leader might not come to groups tonight or my friends might not be in a ‘open’ mood. Because if they aren’t, I’m going to have to keep it all in for another week. I feel extremely sad that my dad and stepmom are taking my sister on the trip that they’ve told me we’d do for years, and especially the fact that I didn’t even get that news from them. I’m lonely because I feel like I don’t even have a dad. I feel like the majority of my parents are against me. And the one out of three parents that is on my side, doesn’t know how to communicate with me. We can’t talk for five minutes before being at each others thoughts. I feel like I’ve drawn the short straw all of my 15 years. And when I go back to draw another one, they just get shorter and shorter and shorter. I feel like I’m in a downwards spiral to a worthless, nonexistent relationship with the sister I fought to be with. I feel like she doesn’t know how much I love her, and I fear that she’ll never know how much more God loves her. I’m confused of what to do with my summer, with my deep desire to go back to where my heart is- Nicaragua. I just can’t hear Gods voice in this. And I feel like if I knew where he wanted me, he’d push me past the money issue, and find a way for me to get there. I feel stuck and confused and hurt. I feel like a three year old, winning about having to pick up her toys, I feel bad for expressing all my hurt. And I feel lost. I know that God is for me though, and that HE has a better plan, that HE is bigger, and with him I can do it. He’s working for my good, but right now, it’s just really hard to see. Nicaragua. Nicaragua. Nicaragua. My best time there so far. I was so out of my comfort zone, and I was just experiencing constant joy the whole week. It was amazing and wonderful and absolutely indescribable. Getting out of my comfort zone WORKED! As I look back, mostly during summer, I just stepped out time and time again, and the greatest things happened. I started to lead my 6th grade girls at church, and they are one of the biggest joys in my life. They teach me so much, and shoe such innocents and grace, it’s amazing. I traveled, all through Gods doing. I was provided for again and again. I went to three different states and a whole other country! God is so good. Being in my bible worked! After I got my journaling bible, my desire and longing for being in the word was multiplied by 1000. To be able to have space to write down little things, or even paint the whole page, was so fruitful for me, I am so glad I made the investment in my sweet bible! Staying connected worked! I realize as I’m writing this, that now that I’m disconnected from a lot of things I was connected to, being involved in family and friends lives is so important. To maintain tough relationships and not just go MIA for a week or month is no good. Taking time to study before the night before, defiantly, defiantly worked. Kindness worked, service worked, love worked and Jesus (always) worked. If I stopped chasing perfect, contentment would happen. Satisfaction, fulfillment and gratefulness would happen. My perfectly imperfect 2016 is happy and fun and fulfilling. It will look like talking to my mom and doing things with her, but also being able to be doing separate things, and not just after we’ve fought. It looks like separated, but not angry. It will look like choosing love before choosing pride. It will look like restoring relationships- with my parents, my sister, and my relationship with school. It will look like waiting and trusting, because Gods got bigger plans, and they’re for my good. My messy, perfectly imperfect, fun, fulfilling, happy 2016 looks like learning from God. From having QUALITY time in he word, rather than me timing myself or having myself read a certain amount of chapters. It looks like learning from him who knows everything and changing my life forever. Pride has not and will never work. Pride is destructive, and what it has destroyed is not ok. Yelling has not and will never work. Fighting and not giving up the fight because of (stupid, stupid) pride, has not worked, in fact, it only makes things worse. Comparison and chasing all the perfect things had not worked, it only makes me feel inadequate, sad, and worthless. Comparison is no bueno. Disconnection has not worked, just giving up also does not work. It might make things feel better for a bit, but eventually it makes everything more messy (the bad mind) and hurting. Natalie- she encouraged me with anything I put on the table. She prayed for me and let me help play with her babies and is literally the sweetest, most genuine person I’ve ever met. Jessica- one of the strongest women I know. She’s gone through so much, and is still going though some of the toughest times. Her openness and willingness to share with complete strangers her struggles is so inspiring and I hope I can have her courage one day. All my 6th graders- they are just the sweetest little girls and they show me so much about God, myself and they’re teaching me how to lead others in a helpful way. And again, their willingness to be vulnerable is so encouraging. Dawn- she just continues to be the example I long so much for, of what a good Christian woman, mother, and wife looks like. She’s always there to encourage me to try new things or just keep going, and I’m very thankful for her. Kassidy- again, her strength and vulnerability in her hard, hard season was so inspiring to see. She always asks how I’m doing, she knows what’s going on, and we can always encourage each other with something we learned or a verse, and I just love having a friendship like that. I just see a jumble of broken things. I see sad things and good lessens. Getting out of my comfort zone worked, disconnect did not. Other people’s openness and willingness to share deeply impacted me a lot. Comparison, fighting, yelling, and especially pride, are not fruitful. In ready for some big change. 1. Be in the word. Because when my life is based on God, the rest of these goals will just fall into place. I’ll learn where I need to be and hear God’s voice, I’ll be able to know his word and keep it in my heart, I’ll be able to keep his commandments. I’ll be rooted in faith. 2. Create gratitude. Because I have so much and I want to realize it. I don’t want to go through my day blinded to my blessings. I want to see what God’s given me so I can praise him with thankfulness and just be on fire for him! 3. Cultivate a relationship with mom. Because I want that. I want to have a best bud, a mama. Someone who I don’t fight with. Rather, someone I can talk to, a friend, a helper. This is going to test my communication skills and my patience, but it will be worth it. I want to honor my mother, I want to respect her and love her. I want to reflect Gods love for her in myself. 4. Make healthy habits. Because this body is not mine, and I’m not even going to make it to 80 if I don’t start now. It will change my lifestyle, make me more fit, happy, content. And I hope to be able to honor God by taking care of this body and this life he’s given me by making healthy choices this year and forevermore. 5. Start praying.Because I want to grow with God. I want to learn to hear his voice and be able to pray for people and have confidence that it will work. I want to learn to be comforted by prayer and be able to reach out to people and ask how I can pray for them. God bless you for each heart and life you move with you being so open to lead with Jesus in front. At the end of 2016, I want to have TAKEN THE LEAP AND GROWN IN FAITH. I want to look back and see less PROCRASTINATION and more ACTION. I want to have cultivated DETERMINATION AND GRACE. Specifically, even though it feels so big and scary to write out, I want to look back and have done this: KEEP MOVING IN FAITH. I want to have chosen MOVEMENT over LAZINESS. In order to make things happen, here’s what I need to do today to get it started: GIVE MYSELF GRACE AND START WRITING A VULNERABLE POST. I have decided to TAKE THE LEAP AND FOLLOW JESUS. At the end of this year, I will celebrate progress, not perfection in all of this by SINGING SONGS OF WORSHIP. 1st Action Step: Finish my goals and Pinning. 2nd Action Step: Read a devotional and pray. 3rd Action Step: Clean up my office shelves. I need this. Doing this in 2014 made me more grace-filled than ever. Dropping off in 2015 made it a difficult year, but I had plenty of breakthroughs to know that I need to go back to God. And His words. Every day, just one portion of scripture to study and learn from will anchor my day. More grace. More love. More empathy. More wisdom. Wiser and closer to God. I think that’s all I really want — to be closer to God and be wiser in the places He wants me to be wise. – Follow SRT and IF:Equip again. – Print a new Bible Reading plan. – Use my Bible Study notebook and have it ready at my work desk every day. – Finish reading Women in the Word. – Use my SRT / YouVersion app. – Write a scripture on Post-It everyday to meditate on. – Get a whiteboard for grateful and God moments. Let the word of Christ richly dwell within you, with all wisdom teaching and admonishing one another with psalms and hymns and spiritual songs, singing with thankfulness in your hearts to God. so that Christ may dwell in your hearts through faith; and that you, being rooted and grounded in love, may be able to comprehend with all the saints what is the breadth and length and height and depth, and to know the love of Christ which surpasses knowledge, that you may be filled up to all the fullness of God. Talk to God about my joy! Because we need to feel closeness everyday in order to honor God with our marriage. Because we are ONE. My husband and I will both feel more loved, and we can anchor our marriage in Christ. Loved. Understood. Closer to my husband. Enjoying marriage. – Decide on a date night restaurant every week or a special meal to cook! – Read the marriage Bible. – Print out the PRAYERS FOR YOUR HUSBAND from VMP and pray every morning. Grow my business by MOVING. I know in my heart that God has bigger plans for me, and I am struggling to fulfill them by being distracted by other things and succumbing to laziness and procrastination. God wants restful work — but I still need to WORK. I want to glorify God with my business and life. And that is making the LEGACY word He has given me happen. Glorifying GOD in my business and a sense of fulfillment like no other. Nothing fills me up like God’s love and plans for me. Feeling more purposeful will also rub off on my husband and friends. – Pack my office, place purposeful things at strategic locations. – Whiteboard for gratitude and prayers. – Pray before working everyday. – Start working on IGNITE / CULTIVATE LEGACY and continue expanding LIVE YOUR LEGACY. – Write new mission and vision for my business. – Update website to reflect new clarity. – Create systems that makes work more efficient and communication with clients less cumbersome. – Dress up for work! When I’ve launched the things GOD placed in my heart — not the other shiny objects I want to launch after seeing others do! A trip to Western Europe — only because being in London really fills me up and shows me God’s majesty! – Webinars / Periscopes for free training every two weeks. These have helped SO many people but I’ve stopped doing it. I want to give back, give what God has placed in my heart to teach and equip others! – Blog openly and vulnerably. I love to write, and I want to write every week in my newsletter and blog about life and business. About inspiration. And help bring others to discover legacy. – Be more involved in The Influence Network / IF / SRT. Lead and be part of Bible studies. Have more God-filled friends and companionship to learn to be a TEAM that God has called me to be a part of. To serve the Lord in more ways! – Give more. Consolidate my clothes to give away and set aside an amount a month to give away to the people who need it. Because God has called to love by ACTION, not just words! – Take time off the Internet. Like REAL time off. Do Holy Yoga at the park. No Facebook every other day. No online shopping just because. Just BE in God’s presence and enjoy my life. As it is. – Contentment Challenge x Capsule Wardrobe. My Wardrobe is due for an upgrade in 2 years! I need to buy staple clothes I can wear all year round (instead of clothes that just look pretty or trendy), I only need a very small wardrobe, continue what I’m doing, and stop buying unnecessarily. – Reach out more. Reach out to collaborate more. Ask for opportunities to work with people I admire and love. Step out and know that God will do the rest because the yearning in my heart is not for my own sake! And if it is, let God close those doors. – Be prayerful. Pray and be grateful in everything in life. Cultivate a prayer and grateful journal. Because I NEED this. I get so caught up in negativity sometimes. Oh my GOSH those just FLOWED out. I’m feeling so grateful now!! Thank you God!! I never knew these were the things I really wanted to do. I have more in my mind but I know those do not fit! They are by-products and NOT core goals for the year! 🙂 I’m LOVING this and cant believe the breakthrough!! My 3 action steps are to 1) dive into and truly study the word of God, 2) share my faith more boldly with my friends and cultivate those relationships, 3) share my faith with a nonbeliever or a stranger. thank you so much for this blog post, it helps me so much at the beginning of the year!!! Just finished reading this series and finished the 2016 Powersheets prep work. I have never been so excited for what is ahead of me than right now. Thank you and your team for all you do! Thank you for leading me back to God. This is changing my life. May peace be with you. I would love to try out these Power Sheets! I stumbled across your book and the powersheets and they have truly reinspired me for this year. 2015 was a year of multiple hard hits and I want 2016 to be intentional and positive, even if there are more hard hits. Thank you for your story and what you do. Today I encourage someone to continue following God and the dreams and desires that God has place inside of them. In 2016, I will be joyfully open to God’s plan for my life, living fully and creatively right where I am. It will be a year of less trying and more trusting. I will be open to new adventures and new possibilities. I will make space in my life for what truly matters, investing in my faith, family, friends, and using my creative gifts fully for God. I will spend less time mindlessly consuming (TV, social media, shopping, etc. ), and more time cultivating contentment, community, and creativity. I will seek to experience abundance through simplicity (shopping less, “scrolling” less, fearing less, fretting less!). I will prioritize prayer and seek to live out Hebrews 3:13 in all I do, encouraging others daily to live their own inspired lives of possibility. Above all, I will live each day fully for Him, with purpose, passion, and positivity. 1 Friday per quarter just for me to have fun doing something on my own! I read Make It Happen last Fall and it really hit home with me to focus my priorities on: my family & God . I wrote down so many quotes from your book and one that I really love is “Use your gifts on purpose.” I truly believe God gave each of us gifts to bless others’ lives and this is a key element to making and sharing my artwork with others. THANK YOU for sharing your life and your thoughts and encouragement with the world. You are blessing each of us. God bless you and your family!!! I’m so grateful to hear this! Thank you so much for the kind words! I encouraged my sister today by telling her how much I believe in her! Lara, this is awesome and you are such an inspiration! This series has really made me think about what my 2016 will look like and I have 2 themes: Connection (spiritual, relationships, friendships) and doing work that matters. All of my other goals fall under those themes and so far it’s been a bit of an interesting start to the year, but I’m determined to keep my motivation high! Thank you so much for all this! Also, I just emailed my sister and told her she must check out this series! I am a homeschooling mom, I work from home in social media, I just launched a new business for something I’m passionate about that I hope will give me the financial and time freedom I so desperately want. Setting goals, prioritizing my precious family time and spending in God’s Word are crucial to me. I would LOVE the chance to win this bundle to get 2016 off to an amazing start. xo. Would love to try these! Hi everyone! I wanted to share with you my word. This whole time I thought it would be “Pursue” bc I want to be active in my life this year, instead of sitting on the sidelines and letting things happen on accident. But today was the day to choose my word and as soon as I looked at the box, It changed to “Hope”, which is my daughters name. I need to feel and embrace hope in my life. And the most meaningful part is, my daughter, Hope is my reason why. Love these goals!!! I had already decided to make studying the Word more of a priority this year since I could feel God pulling me to study more. Thank you for writing this!!! It gets me so fired up to make God’s word my top priority!!! Today I encouraged a friend by giving her some gifts that will help her be inspired to have a great year. I also have been praying for her. ooh, what a wonderful start of 2016 .. never done this challenge and would like to join .. thanks for the chance to win this. I love this! I think if I were to win this it would help me not only spiritually, but emotionally as well. WHY? Because I have been inconsistent in the past in developing my relationship with Him. Because I know that in order to really grow and learn I need to send time with Him. Positive Effect: I will become closer to Him and know what He would want me to do. How will I feel? I will feel like I truly did my best to know Him, I will feel peace and happiness and strength . Why? Because I need to shift my focus from loss to becoming STRONGER- I need to strengthen who I am, my body and feed my body healthy foods. How will I feel: I will feel better about myself – who I am and about my body and I will feel STRONGER! I appreciate your blog and book- which I’m still using as they have gotten me to really Make it Happen this year thank you – it was what I really needed to hear and now I need to just do. I encouraged my neighbor- she was going through some stuff with her daughter and I listened, offer help and encouraged her to be Strong- provided another opportunity to her daughter. Hi everyone, I have been reading though some of the comments through this series (since this is my first time doing this, I wanted to see if I was on the right track) and have to say that I am moved by a lot of them. I feel so bless to find Lara’s website last year and now, thanks to the sale, just bought her book Make It Happen. I can’t wait to get it started and having 2016 be the best year ever for both me and my husband. My 2016 word is WORK. I am convicted about not working heard enough to make things work in the past, including the most important, relationships with family and friends and especially my relationship with my husband. I need prayer for this as I have not worked hard enough to keep this together, I have screwed up on my part of the relationship (communication, truth, & taking him for granted). My marriage has problems and with this new found journey, my 2016 word, and hopefully some encouragement from others, I will be able to repair this to make it better than ever. Thanks again Lara for everything. I just wanted to add I would love to win the giveaway as all of those items would help me make 2016 the best year ever… Always reading and getting encouragement from your blog! Good Luck on the adoption, God willing everything will turn out just fine. 🙂 God bless you and your family, love and prayers to you guys! My word for 2016 is ‘Intentional’ because I no longer want to drift through life, just getting from day to day, moment to moment & just wishing for a better, more peaceful & joyful life. I want to live my life for The Lord & not for myself, and to be the woman, wife, mother & friend that He has called me to be. Thank you for these tools for people like me that have not been able to push ourselves to set goals or write intentionally for the longest time due to fear & continual failure to follow through on the things that matter. The Lord is enough. Here is come pages 32 -33! Thank you for living so boldly for Christ. Thank you for being such an amazing steward of His word and such an inspiration. I pray that God does something amazing with my life and career as He has done with yours. Honestly, my goals for 2016 are the same as yours. To get in His word and truly study it like I never have before, and to strengthen my prayer closet. I love how you outlined such specific steps for these goals you created. That’s what i need to do. I would love to win your Powersheets. I’ve always wanted them. I have your book and am going through chapter 4 right now and I really want to be intentional with my goat setting. The only reason I haven’t bought them is because my budget just doesn’t allow for some additional purchases right now. Thank you again for your inspiration. Today I encouraged a friend of mine who is feeling overwhelmed with her crazy schedule. She is the mom of 2 girls & her and her husband work crazy busy schedules & she needed me to pick up her kids from school. She apologized a million times although I told her it wasn’t necessary. This season of life will pass and things will slow down. I let her know that’s what I’m here for! When she needs help, I’m a phone call away! I encouraged my father who is going through some physical problems. I so cherish this blog and all of the encouragement it holds! I wrote a letter to a friend denoting all the ways in which her faith blesses me through our friendship. I am just so encouraged by women after God’s own heart both near (friends in person) and far (testimony and witness through blogs like this one). Thank you for doing what you do! Still refining my goals. But just had to encourage my little sis preparing to go back to work after her holiday. I could almost hear the weight on her shoulders. She is just so talented, but just worries so quickly because she wants to do her best. Told her to worry and stress will not make anything better, it will just harm her, which is not worth it at all – do you best and most of all enjoy your passion! That is enough. This is such a neat giveaway!! Here’s to 2016! As far as the encouragement goes, I texted a sweet friend I met in Washington this summer, picking up on some accountability for goals we have in common! Making it a habit to call out the good in her and rejoice with her triumphs! 1. Cultivate heart healthy (physical) habits that are maintainable! 2. Read the entire Bible and paint/journal along the way. 3. Cultivate contentment with a Contentment Challenge. 4. Read 52 books in 52 weeks. 5. Finish grad school strong! 6. Document the year creatively with Project Life and One Little Word! 7. Blog/use the internet with intention to encourage others and point them to Jesus. 9. Contribute to the Illustrated Faith team with joy! 10. Disciple my girls well. Lara, wow you are such an inspiration. Thank you so much for introducing me to Jen Wilkin’s book…I started reading it in December and just finished it. It has literally transformed my time in the Word. Thank you for sharing your goals. Those are such GREAT goals. Will be praying for you and your family all year long. My biggest goal this year is to finish my degree – after multiple traumatic events during my college career, fear consumed my life and I had to press pause and take the time to get healthy. Now I’m saying NO to fear and YES to my dreams. It’s so great to read everyones replies and comments! I’m so amazed what we all will accomplish this year. Step by step. I spend the day being present and took two of our kids to the slopes and went sledding. Such a great time. After sledding we had a really nice cup of cocoa (you now the one where you mix cocoa powder, sugar and a small amount of hot milk, stir and “taste” i.e. eat one batch, do another one and completes the step and make a full cup of cocoa). Oh, that is childhood memories for me. The kids were so happy! And so am I, still. I hope you all have a great Sunday! I’m excited to finally share my goals! 🙂 I came up with five main goals for the year, knowing that I may add or subtract from those main five as the year goes on. 1. Be open to God’s plan for my life and live fully right where I am. I’m listing this one first, because it’s really the heart behind all of my goals this year. This one goal obviously encompasses a lot, but some of the action items I’ve listed include going through Holly Holt’s In The Wait study, studying and applying what God has to say about surrender, and investing in the moment and what matters — my faith, my family, my friends, and my creative gifts and art. I want to be open to new adventures and possibilities and praise God for all He is doing! 2. Prioritize prayer and choose God above all other things. Seek first the Kingdom. Goal #2 really goes hand-in-hand with goal #1. But it was important enough to be called out and listed separately. This year, I am going to really be working on contentment (more to come on that in the goals ahead, but this goal is going to be the heart behind all of that). I’ll be spending lots of time with my Val Marie Paper Prayer Journal and focusing on choosing God first in all things…starting the day with Him, staying with Him throughout the day, and ending the day with Him, too (stealing that phrase from my friend Bailey). 3. Experience abundance through simplicity. Hello again, contentment! With this goal, I really want to focus on making more space in my life for what matters. That will mean doing things like saying yes to cell-phone free time and saying no to mindless shopping and “scrolling” through social media. I will be reading The Life-Changing Magic of Tidying Up and cutting through as much clutter and distraction as I can (both mentally and physically). 4. Cultivate contentment, creativity, and community. You’re really seeing the contentment theme now, yes? 🙂 Contentment, creativity, and community are three areas that I really want to focus on in 2016. And even though I know contentment is threaded throughout each goal, and it might not make total sense to list it again here separately, I just couldn’t get the phrase “cultivate contentment, creativity, and community” out of my head. So on my Powersheets it goes, and I’m excited to see how focusing on those three areas impact the year ahead. 5.Use my creative gifts fully for God. Honestly not sure how this one will look just yet… I’m trying to think through how I’ll use this blog, as well as my Instagram creatively in the next year. I’m also contemplating some new collaboration and writing endeavors, so I’ll be praying about those things and seeing where He leads! Today i encouraged a friend and business partner to take a step in faith in making a networking contact . she was doubting her ideas. She is an awesome woman of God. Just heled her remind her how loved she is. Encouraged a friend to join a mom’s community group! Love this! I encouraged a friend today by writing and sending her an encouraging card. She LOVES getting written letters and cards, so this means a lot to her! “We’re not going to fertilize the fear this year, friend! Are you with me?” Yes! I am so with you, Lara! Fear held me back way too often in 2015. This is the year I am choosing Faith over my fears, doubts, and anxieties. Life is way too short to waste any more time in fear. I believe that God has a very good plan for each of us. And I want to walk fully, abundantly, intentionally into ALL that He has for me to receive and to share. At the end of 2016, I want to celebrate the fruit of an intentional and full year. Reflecting on each month’s growth and new life. I want to have a growing faith personally and alongside my husband. I want to look back on my notes of times that I came to God (instead of distractions) and how He answered my prayers during that time. I want to be overflowing with the fullness of His joy (Psalm 16:11). Most importantly, I want to celebrate a year full of purpose and prayer. Prayer. Intentionally come before God in prayer each day. Pray each night with my Husband – on our knees. Why? Because He alone is the way of love and all good fruits (of the Spirit). I want to draw near to Him in love, so that I may receive and love others well. Why? Godliness with contentment is a great gain. (1Timothy 6:6) Because gratitude and contentment produce joy and a proper perspective. I want to be grateful in all things, even and especially the little, daily things. Action Steps: Being content with who I am and where I am means embracing this one life I HAVE been given. My life is a gift, a gift to be shared. And I want to start treating it that way. It means no longer wanting what others have (lifestyles, etc.). Saying no to allowing myself to be distracted by looking at other people’s lives online. Saying yes to focusing on the present, right in front of me, each day. And being grateful – on paper, out loud, or through my actions. Also, this means beginning my days intentionally. Commit verses to memory (each week or month) and recite these right when my eyes open each morning. I do not want to begin my days thinking of stressful to-do lists. I do not have to do everything in one day. Focus on what’s most important first – seeking God – so that I may greet the day open-handed. Thank my Husband often for his hard work for our family of two. Action steps: Pray. Pray. Pray. Pray some more. Allow God to form these prayers over the year. To dispel my fears and replace them with hope. Be open and listen well to when and what He places on my heart. Also, pray with my husband about motherhood+fatherhood. 2016, you are the year that intentional, meaningful, faith-filled living happens!! Thanks for your continual encouragement through your words, Lara! Lara, thank you so much for this series; for going through it with us step by step! Going through this little by little has been a blessing, it’s given me big things to think about and then time to think about the goals for this year and where I want to be. And it’s all leading me to here: my biggest goal this year is to let God to write a new story with me and my family; to let him take my grief, my emptiness, my pain, and my not really knowing how to hope; and to write a better story, a bigger story. I’m going to accomplish this by PRAYING, constantly, as if I am in an on going, constant conversation with my Father, my Jesus. I’m going to stop trying to push my plans and stop the constant worrying about everything. I know it’s going to be crazy hard, but I also know that if I keep praying and taking it a little at a time Jesus is going to meet me, He will lead me on this new path in this new amazing story. I also plan to accomplish this by constantly looking for the JOY all around me in Jesus’ blessings. My prayer for this year (my word) is to remember in my heart that my JOY is in Jesus; through happiness and deep grief, I have JOY in Him. I know everything else will fall in line, if I work on and stick to this goal and remember my word. Thank you again. Saying prayers for you, your goals, and your beautiful growing family this year. I really liked the format you used for setting your goals! I felt that it helped ensure that there was solid reasoning and thought behind each one, rather than encouraging castles in the clouds. One of the things I do is publish my goals on my website for accountability purposes but also to share them in case other people need inspiration or want to see that a lot of us probably focus on the same things. I create my overall goals, a dream list, and then an action item list – thought I’d share them! 1. Read through the Bible in one year and memorize one book of the Bible. 2. Learn to love my husband well by appreciating our differences and learning his love language(s). 3. Cultivate a life of joy, gratitude, and peace, not of fear, negativity, and comparison. 4. Invest in learning how to make my blog work for me. 5. Make my writing a priority and don’t play it safe. 6. End my addiction to my phone. 7. Pursue a life of simplicity by chasing contentment. 8. Become a better steward with our finances and give generously. 9. Strengthen existing friendships and sow seeds to grow new ones. 10. Embrace boundaries and learn to live in the moment. I just discovered you today. I guess I’ve been under a rock. Your name showed up 3 times on my social media networks so I had to dig deeper into who you are, and I am so glad I did. You are such a blessing and your words are so rich with wisdom and guidance. I can sit here and read all night! My goals are 1) to cultivate new friendships and connect with people face to face (sometimes can be difficult when you work from home and a mother of 2! ); 2) spend time in the word and in prayer daily; 3) intentional family time. This is so great! You will rock your digital detox.. they are so good! First of all, ALL praise, glory and honor must go to God for I would not be where or who I am today without Him.! He is worthy to be praised! Step 1 : I have been chasing money, money, money. Money for my personal needs and money to build the business I know God has called me to. I have been chasing freedom and simplicity, and doing my best to fit the roles that other people need me to fill so that their needs and goals can be fulfilled. I’ve also been trying to make the old ways of living, doing and being work in today’s world. Yes, I am exhausted!!! Step 2: I am feeling exhausted and hungry for a new life, new home, more of God, new perspectives, a healthy body and genuine relationships. I am longing to write, speak, teach, coach, counsel and guide women on their spiritual journey. Step 3: What worked in 2015 is my stepping down from my management position into a part-time position. This change has allowed me to spend more time before the Lord seeking His will, and also to re-evaluate my entire life. Who and what must I let go of for freedom and simplicity and the life I desire? What is no longer working? In making these changes, I have received love and support from a family member in unexpected ways. This has been a glorious gift! Step 4: My “Messy 2016” looks like white, open space, lots of light, desert (Isaiah 43:18-19), complete reliance on God (Isaiah 46:4), the fulfillment of Isaiah 54:1-5 and 61:1-3 through me and my business/ministry. It also looks like lots of learning from masters and experts, knowing more of God and making Him known, the pursuit of new avenues of income, joy, humility, laughter, abundance, and sweet communion with my Lord and Savior. Step 5: What didn’t work were my financial and health/wellness plans. Dying to self didn’t go so well, either. Basically none of my plans worked, but God showed me that I have been resting on my past successes and accomplishments and refusing to learn or try new behaviors which shut me out of so much more. Self-sufficiency had to die. In order for me to be who God created me to be, He had/has to be in full control.This means comfort has to go and uncertainty must take its place. Step 6: The following people have inspired me in 2015 :My district manager for opening my eyes to the truth that I have been living in my past. This is fine, but will keep me from experiencing the new. My friend Candi and my sister Leah for encouraging me. Shonda Rhimes and her book “Year of Yes.” Viola Davis’ husband’s encouragement to her when she was nominated for an Oscar and decided not to wear a wig – “Step into who you are.” Pope Francis for being an example of Jesus – true humility, compassion and love for God’s children. “Live Your Calling” Youtube video. Oprah who said, “God, use me. What would You have me do?” And my pastor, Bill Harmon who shared God’s call on his life and courageously made this call our church’s mission to do what needs to be done so that all may know the love of Christ. Step 7: The themes I discovered were letting go, what true service really is, I am called to serve God and His daughters, I must trust God in ALL things, I am not my own,. I must change my thinking, my focus and my words in order to move forward. Most importantly, I am madly, deeply in love with my Lord and Savior Jesus Christ and want Him more than anything! Step 8: I am saying no to who and what hinders God in my life, unbelief, comfort, my past and old ways of doing things. I am saying yes to God, His call on my life, doing the work required, more solitude and silence in His Presence, simplicity, freedom, separation to Him, burning bridges and making it impossible to turn back, letting uncomfortable be my new normal and keeping my eyes on Jesus, the Author and Perfecter of my faith. Step 9: My word for 2016 was FOCUS, but I have decided that it needs to be YES. Yes to new, different, uncomfortable, doing what seems impossible, celebrating, being vulnerable, practicing the art of receiving all that God has for me. I will focus on building the new by saying YES! Step 10: My goals for 2016 are: Knowing God by studying alone and under master teachers and ancient Christian mystics, practicing the Christian spiritual disciplines and writing what He teaches as this is where I get the greatest revelations. My second goal is to make Him known through my new businesses (they are not really new, just revised by His leading and grace) as a spiritual director, life coach and image consultant. Risk everything, be recklessly abandoned to God, take leaps of faith in using the gifts He has given me to teach, speak, write, coach, preach and counsel His daughters. Why? Because I am madly, deeply in love with Him and like the Apostle Paul, I am compelled by my love for Him and His love for me to give back to Him what He has given me. Step 11: At the end of 2016 I want to have answered and begun filling out His call on my life by doing the work of counseling, coaching, guiding, teaching and writing. There will be less clutter (physically, mentally, emotionally, relationally and financially), and more genuine friendships.Even though it is scary, I will relocate to a different state and start this business/ministry. I want to have chosen this over settling in order that someone else may be comfortable and happy. In order to make this happen, I am registering to attend a 6-day training session with a master image consultant. I don’t know where the money for this will come from, but God does and I am relying on Him to make it happen. I’m believing God! At the end of this year, I will celebrate progress, not perfection in all of this with a beach vacation. This will be many dreams come true! STEP 1 – What have you been chasing? And how does that make you feel? Honestly I’m not sure that I’ve been chasing anything – more like hiding and just trying to get by. I want to be perfect but I’m so overwhelmed by all that would take that I’m stuck. As a result, I’ve been making very little progress on things that I want or need to get done or improve. This makes me feel like I’m letting myself and my family down almost all the time since I’m a stay at home mom for 3 kids 4.5 years and younger. I want to make healthy meals all the time or at least half the week that my kids and husband will all eat and enjoy ( i have some very picky eaters and food allergies). I want an organized and clean home where everything has a place. I want there to be a simplicity and a warmth about our home in the way it is decorated and lived in. I want to have patience with my kids. I want our kids to listen and follow directions and be respectful at least a good portion of the time! I want to feel like our home atmosphere and I are teaching our kids the gospel. I want to pray for our kids and husband daily. I want to play with our kids and have fun ideas for ways for them to play and learn. I want them to watch less tv and youtube videos. I want to read books to them every night. I want to have quiet time with God that I look forward to – reading scripture, praying, and memorizing scripture. I want to look like i have it at least halfway together when I pick up at my oldest son from pre school or at the park instead of frumpy with greasy hair b/c i shower irregularly and i’m pretty sure the recent shampoo i picked doesn’t match my hair type. I want to be generous and a great friend to others but because I feel like I’m not good at that I don’t pursue relationships well. in the same vein, I want to have people over and show hospitality but i feel like i don’t cook well enough to serve them and then feel like when they come I never know how my oldest son who is very spirited will act and it always seems awkward like there is nowhere for them to sit. Wanting to be perfect makes me feel awkward and less than so much of the time. It makes me quit before I start. It makes me anxious and makes it difficult to focus. It makes me end up wasting much of my limited free time on social media or watching tv looking at others lives. It makes me feel like God must not want to love me. That he must want to harden my heart because i’m always falling short and never giving him time much less my best. It makes me want to give up and hide. Overall I think my goals and how i want to change are good things but I don’t offer myself the grace to get started and fail in the process so I just stay stuck. STEP 2: How are you? I have lots of special moments with my husband and each of our three kids in their own ways where I feel blissfully happy – like I couldn’t be happier- but a lot of my time I feel tired, anxious, and frustrated. I quit my job because I wanted to work on the above goals listed in step 1. I knew it would be hard but I thought i would do the hard work and make progress and it would be good for our family. Instead, it has been almost two years and i feel like i have spent no more time with God than I was, I feel like our kids have no more of an idea who God is and I have no more of an idea how to impart that to them than i did two years ago. I feel like I have less good ideas for meals to make and eat and the house is more cluttered and no more welcoming than it was 2 years ago. And honestly I feel like I have fewer friends/community because when I was working I at least had friends at work. Now all friendships require me to take initiative and my husband and I are both introverts so this is something we both have to be very intentional about and three small kids makes it even harder. It seems easier to just neglect this portion of life but then I feel lonely and isolated. Basically i feel like no progress has been made so I feel frustrated, lost, scatter brained and wondering if change is possible. STEP 3: What worked for you in 2015? And what lessons did you learn? We welcomed our daughter to our family. Despite late nights and lack of sleep, she has brought me so much sheer joy. Her birth story is also a testimony for me. I was very nervous about her birth and getting to the hospital on time since her brother arrived very quickly and I knew that I would likely be alone (of course the nurses and doctors would be there) but no family for the birth. I remember expressing some general concern to our pastor about going from a family of four to five along with a prayer request for my sister and at the end of the email it said Do not be afraid. God is with you. And I literally could hear those words being said to me over and over as I went into labor by myself after my husband had to leave with our two sons. I still felt sad that we didn’t have anyone in our city close enough to us to watch them but yet really felt God was close regardless of who I have or haven’t been in the last year. My relationship with my husband. I feel like we have enjoyed a real tenderness in our love this year. I’m sure we still have much room for growth but this is honestly the greatest gift along with our daughter. I also reached out to a couple of old friends from church toward the end of the year with more honesty than I have in a long time as to how I am doing and it felt good to feel known and I hope this will continue more. STEP 4: If you stopped chasing perfect – or whatever you have been chasing that is wearing you out-how would your life change? What does your perfectly imperfect Messy 2016 look like? I think if I stopped wanting to be perfect I would be able to try new things more easily and therefore start making progress on some goals. I know that I can easily fall into the all or nothing sinkhole where if I don’t know that I can accomplish something just right than I don’t start all all. Perfect example – I bought an Instant Pot over a year ago to try to make healthy meals with and I have still not even opened the box. For some reason, it seems just too overwhelming to try anything new. Every recipe I see I think well surely I will screw that up and/or no one will eat it anyone even though I know everyone is tired of the five same meals we eat every week for dinner. We need something new especially since one of my sons has been diagnosed this year with multiple food allergies. There are sadly many more examples of this – like I want to start a small garden for a couple of years but have no idea where to start on that so I tell myself it will fail and be a waste of money so again nothing has happened. Perfectly imperfect messy 2016 means trying over and over again to remind myself of my real purpose in Christ and trying over and over again to pursue him and want to pursue Him and praying for the power of the Holy Spirit – the real change agent – for this to happen. It means making time to read scripture and pray. AND giving myself grace when I don’t and restarting instead of letting the enemy tell me lies that God no longer wants me as His child. It means praying and praying even though I’m struggling in my belief that prayer always makes a difference but instead believing that if I trust God and come to him in prayer this year, that he will heal my unbelief. It also means forgiving myself for not praying more for a someone I worked with because I just believed she wasn’t going to make it. I should have and wish I had prayed more for her before she passed. I honestly think that part of my problem has been if prayer doesn’t matter that much than I wasn’t so horrible not to be disciplined enough to pray that much for her or for my kids over the last few years. And prayer also trips me up because it also feels like another performance trap for perfection – i.e. whoever prays the most will have the most success, best behaved kids etc. And i don’t want to be praying in that spirit either. Perfectly imperfect messy 2016 will hopefully bring some peace to prayer and my relationship with God. Perfectly imperfect messy 2016 for me looks like giving myself the freedom and permission to try and experiencing joy while trying new things even if they don’t work out. I’m sure some will work out surprisingly well which will help me move forward and others won’t. When new things don’t work, I won’t fester in it. But instead I will say and model to my kids oh well we tried and will try again. It means trusting myself to be able to pick the things that I love – whether it be as superficial as new clothes or decorations for the house or recipes or activities with the kids or a new hobby or side job/volunteer opportunities for me. Messy 2016 means celebrating big and small moments for my family. The celebrations don’t have to be perfect but I won’t ignore them because I don’t think I have a good idea or am good at that type of thing. It means opening my home up even when it’s not perfect to friends and neighbors. Messy 2016 also means opening my heart and prioritizing relationships – with my husband, kids, family, and friends. This will require less time on the internet or in my head and more time trying to be present in that moment. It will mean seeking out good play with my kids through planned activities to get us started and their imaginations! It means getting a few open ended toys and ideas from pinterest but less focus on more new toys to try to occupy kids. It will mean reaching out to more experienced moms to gain wisdom and try to learn how to better love my kids, structure our home, and keep Christ central. It means living in GRACE and feeling at peace with who I am and the purpose God has for me. STEP 5: What hasn’t been working in 2015? I feel like a lot of this has already been stated but will had this. 1) Not prioritizing quiet time with God and trying to avoid or hide from Him instead of taking my doubts and struggles about God to God and asking for forgiveness, grace, and healing. 2) Comparison – looking at other moms that I feel like are doing such a better job than me and beating myself up over it or wanting their blessings. 3) Not eating healthy and no meal plans. I think that since I don’t have planned meals for breakfast and lunch – I don’t have enough planned healthy options for myself which leads to eating too much sugar/junk food. 4) Worry & Anxiety. I spend way too much time and energy worrying.. I am hoping that giving up wanting to chase perfect and trying to live on purpose for God’s purpose will help in this area. 5) Waiting for so long to deal with unresolved feelings, conflicts or hard things, or to-do list items. I want to make my goal lists and then act. iIn the last year, I have wasted so much energy remembering things I need to do rather than doing them. I also want to improve in confronting the things or aspects in relationships that are causing me stress rather than just continuing to feel bogged down in stress, frustration, and anxiety from unresolved emotion and concerns. I know a lot of this results simply from lack of sleep but I want to be intentional about making changes when and where I can. STEP 6: Who helped your cultivate what matters in 2015? Who inspired you to live on purpose? My husband – I’m inspired by the grace and love that he offers me daily. I’m inspired by new ways that he seeks God and his trust in God’s goodness. I’m inspired by how much he loves me and our kids and how hard he works at his job and at home with us. my sister – i just love her and how i feel like i can tell her anything and she will not judge me and how she’s just lots of fun and makes me feel fun. my mother – she may struggle with worry and anxiety too but she also prays and has been a source of comfort and companionship since my daughter was born. I feel like she also really has a generous heart that I hope I will develop more of. STEP 7: read over all your progress! Circle or highlight things that stand out to you. CHECK. Themes covered in what I’m saying Yes and Saying No to below. STEP 8: Write your list of what you are saying yes to in 2016 and what you are saying NO to. Saying NO – isolation, hiding, loneliness, worrying, doubting God without bringing my concerns to Him in prayer, anxiety, eating huge amounts of sugar, not trying things because I’m scared of failure, Not believing that the process means as much as the end goal, unlimited time on social media, checking social media while playing with kids, more clutter, quitting before I start, believing the lies of the devil about how God feels about me. letting all or nothing thinking keep me from making small progress on goals that adds up, laziness. No more excuses. STEP 9: Pick a Core word for 2016. What one word resonates the most with you for the year ahead? what word pulls together all that you want to make happen? I hear God saying peace. Peace in who God made me, Peace in my salvation, Peace in how God feels about me, Peace in the power of prayer, Peace in where I am today, Peace when I fail and when I succeed, Peace from anxiety, Peace in spending time with my children, my husband, my family, my friends. Peace in that God is good and in control. Peace from perfection. And from this peace, I can start to hear God, I can start to live on purpose for Him, and I hopefully can start to feel free to live, play, work hard, try new things, succeed, and fail. And in that peace I will know how I am redeemed in Him. 1) Spend time with God daily. – Read Bible. Pray. I will continue the Hello Mornings group and bible study I just started. – Read the Power of a Praying Parent and ask God t to help me get starting praying for my family. -Follow-up with moms from my church community group to help me stay encouraged and accountable. – Develop a Pinterest Board for recipes to try for breakfast and dinner that meet my sons allergies. Ask husband to look at dinner board and together select some recipes to try and then pick one or two try each week from that list. -Increase the community in my life by inviting friends or another mom over at least once a month. -Being more open and honest during interactions with friends. -Continue to participate in moms group from church that i just joined. -No phone/social media while playing with kids..only look at during established times in evening. -:Less tv and more time playing together. -Seek out counsel from other moms about helpful lessons learned and parenting a very spirited child. Thanks Lara!!! I stumbled onto your blog on New Years day and it really has helped me move into this year with a more hopeful outlook and organized action plan! Wow what an inspiring series! Thanks for the time and effort you sowed into this, and most of al sharing your progress. 1. Read through the Word to renew my mind daily and build my faith. 2. Spend time in prayer, intentionally focused on situations and people to notice how God works, to see change and to learn to trust more..
3. To start my blog that has been hanging for over a year – to share inspiration and encouragement because I want to encourage others and build/challenge my creativity. 4. Sharing my faith unashamedly and fearlessly with those around me to make a difference and be a vessel. 5. Look after my body and make healthy choices – what I put in and to get fit and stronger because it will prolong my life and make me feel good. 6. Focus my time on what is important – first priorities being the above goals, my marriage, building relationships, nurturing my talents and feeding my soul with things what I love to do. Such an encouragement. Praying for healthy babies! I encouraged a friend who is seeking a job closer to her family. I just heard about this series and I am so excited to get my hands on it. I need to get motivated, closer to God and organized! HOW HAVE I NEVER SEEN YOUR BLOG BEFORE? I’m in love. I’m obsessed with organizing and sharing Jesus and business strategy and you rolled all that into one. I’m going to go print out every single printable you have and read through it all. Plus this giveaway looks amazing. What a great way to stumble on here! Welcome! I’m so glad you’re here! These goals are so beautifully Christ-centered! Being surrounded by Biblical community with other women and keeping each other accountable is such a beautiful thing. Seeking Him above all, specifically in prayer and time in the word, His truth, and resting in his eternal promises and hope for us in today and even more- what is to come. I am so inspired by this post! Just want to say how excited I am to work out my goals on my Powersheets this week! I absolutely love every blog post, Periscope chat and Instagram picture and I would love to win this to share with my mom and girlfriends! Love your site! So happy to have found it! One other thing—this week my bestest friend began a new job in a completely different industry. She’s a smart, capable woman and I am seriously so proud of her going after what she wants, even if it may seem scary. To encourage her, we went to lunch together yesterday since her new office is down the street from mine. It is such a treat to be so close and she continues to inspire me with her actions! what a total inspiration! I cant wait to get the book and start! I’m working on some big goals this year, so I will need to go back and read the rest of this series. Thank you! Oh my geez! Grabbed the last copy of your book that our bookstore had and oh my! Every word is me! Thank you so much for your obedience and inspiration! I shared my goals of — 1) making a good, healthy morning routine 2) intentionally keeping and making a Sabbath day (or at least an intentional time of rest and reflection) each week to develop peace and strength for the week ahead 3) kick-starting a small, creative business — in the last blog post. But I am so thankful for this daily encouragement and lesson on goal setting. This blog post encouraged me to not only name my goals but make them active, reflect on them throughout the year, refine them, not beat myself up when they aren’t perfect, forgive myself when I stumble and find joy in progress!! I’m super excited to bring these goals into my daily prayer with the Lord. Thinking and writing these goals out are great, but I know that being active in talking to God about them will build great foundations in my life! At the end of 2016, I want to have intentionally planned my day so that I spend more of my work hours being fruitful, more of my sabbath hours being restful, more of my family hours being thankful and more of my time with the Lord being open.I want to look back and see less worry of perfectionism and more gratitude for individualism. I want to have cultivated relationships that are Kingdom-minded! Even though it’s big and scary to write out, I want to look back and have seen myself and friends open a small business. I want to have chosen faith over security of money. In order to make these things happen, I need to get started today by praying about it with my husband. I’ve decided to let my family and friends into my passions that I thought were too hair-brained to share. At the end of the year, I will celebrate progress, not perfection in all of this by taking the day off and watching musicals! Thank you so much, Lara, for these blog posts! I’ve thoroughly enjoyed them as well as Make it Happen — I stumbled into both your blog and book very recently, and all of it is so perfectly timed! I am still sorting out goals etc so I am not ready to share yet. W e have a lot of change coming our way. I just wanted to comment say thank you for your encouragement! You have such a big heart for this community! I am praying for your writing and for the adoption! I shared a blog post on Facebook about not doing everything for our children, but helping them to learn some independence and self-worth, even at early ages. Because sometimes I need to be reminded and encouraged that it’s okay not do everything, even when I want to or it’s easier. And some friends really seemed to appreciate the encouragement. They day has barely started where I live, but I’ve encouraged a few friends with messages of inspiration. They are each going through rough times in their personal lives and I know how that feels myself. Sometimes just the kind word from a friend can make your day a little brighter. So excited to have found your blog! And pumped for the giveaway– what an incredible stash of goodies! Thanks for the opportunity!!! How I encouraged someone — texted a friend that I’ve been missing, just to tell her I miss her & shes fabulous. I am so excited to have come across your website and blog, it is packed full of inspiration and everything I was looking for today! Awesome giveaway too!!! I am a working home-school mom and organization is the key to making it happen in 2016! Thank you so much, Colleen! Sent my preggo bff who’s having a bad week a I love you I hope you are doing better smile text! I cannot wait to get your book & dig into the powersheets! What a wonderful giveaway! I am so glad to hear that, Eunice!! I LOVE the idea of centering my work station around the goals I have for going through God’s word! How ingenious! I get so laser focused with my business and life goals that it can be consuming – but adjusting that so that God’s kingdom is my focus in this practical way – I can’t wait to get started! I’m so excited to get started on goal setting this year! I am new to Powersheets and have loved trying them this year! A friend and I are going them together to keep each other accountable! That is so exciting! I’m cheering you both on! For 7 or eight years now we have been praying for baby #2. I had wondered and sometimes asked God why it never happened. But lately, I have found solace from reading inspiring stories from hundreds of women like you. I am focusing more on counting my blessings each day. Your posts and the idea of goal-setting has inspired our family and we have been doing our family tradition of setting our goals together before the end of the year. Our eight-year old daughter enjoyed that activity. We want to let her understand how important it is to take time and write down our goals. Thank you, Lara for the gift if you. It would be awesome to get a copy of your book and the Powersheets. Hello from the Philippines! /this is a wonderful site. I am so glad it was recommended to me by my sister. I sent a note of encouragement to my daughter and encouraged her to check it out also. STEP 1 – What have you been chasing? I am fearlessly ambitious. When I was younger it was such an unruly strength that many people admired and looked up to – and I got a lot of my personal acceptance of self from it. Now I can’t chase that ambition. God has redirected my life in ways I would have never imagined and I find myself being completely unable to be ambitious with business or life. I had been chasing my own kingdom. And I know that right now the Lord wants me to change all that and to chase HIS kingdom. I am tired of being sick. I am afraid of not living well or being worthless. When I begin to center on who Jesus is and His love for me, my perspective shifts so much. But I don’t want to be a ship tossed in the waves any longer. I want to be fearless to step out of the boat and walk on the stormy waves. I learned that God doesn’t bring things into my life to change my purpose or calling. Only to redirect them, or to adjust how I have been pursuing them. That His love towards me has nothing to do with what I can achieve. My messy for 2016 looks like loving fully, living with joy, and embracing grace no matter how much is outside my realm of control! No more striving. No more fighting life. It’s time to lean into the ebb and flow of the season God has me in. My best friend Hannah has been as sick as myself at times, and she learned to embrace the seasons God brought her way. The example she set for me has helped strengthen my faith so much, and I couldn’t be more grateful for her inspiration! I’m saying yes to: Joy. Grace. Freedom. And Peace. I’m saying no to: Chaos. Despair. Turmoil. Doubt. Joy. Joy moves beyond contentment and truly embraces the path Jesus has set before us in this moment. Joy is being so fully embraced by His love that nothing else can bring me down. Joy is being at peace with everything that may come my way simply because Jesus is walking right alongside the path with me. This is SO encouraging! Such great work! I’ve been reading Make It Happen and it’s a GAME CHANGER. I love everything you do! I’m so grateful you’ve been encouraged, Kaylee! I am so excited for this giveaway! It will benefit my friends too as I will share the prizes! This way we can all encourage each other as we #makeithappen. Best of luck to all. You are a blessing!! So glad I found you! These goals are so good! I’m determined to get my prayer life stronger this year. More time with God needed her before I make my own decisions! Thank you so much for opening your heart to all of us. Love your goals!! So inspiring. This looks amazing! So hoping to win! I just got your book and have preordered the PowerSheets. I am new to your site & can’t wait to explore, learn, grow & get started on my goals! Here’s to an amazing 2016! Encouraged someone today by praying! What an awesome givewaway! Would love to win anything! I have one main goal that has many facets! The goal is ME!! I’ve spent time on everyone and everything else. It’s time to focus on me and not feel guilty about it. My prayer life, my relationships, my health, my happiness/contentment. There are many steps under each goal that are SMART in nature, but these are the main goals. It all equates to GROWTH! I can’t say that I’ve ever done this before, so I’m a bit nervous. If I can be honest…guilty. I will keep these wonderful powersheets and inspirational prints as a reminder that it’s ok to love me. Wow- your words “(choosing) to study the Word more than I study the world” really hit me today. What conviction…I am loving my power sheets and getting SO much done already with those couple with giving up all FB, etc, during the day. This was just thing I was looking for when settling down on my goals. I adore your blog. Such a cool giveaway! Thanks, Lara! I’ve been slowly working through my powersheets… It has been Sooo encouraging! I LOVE the title of your next book, Lara! Thank you for writing. And for the Periscope sneak peek last week. 😉 Will continue to pray over you and your growing family. Love LOVE LOVE you Lara! Your goals are absolutely rooted in such truth. I can’t wait to see God’s story show up through your adoption and I’m counting down the days until Cultivate releases…You are a blessing my friend. You’ve been an inspiration to me as I’ve started my new blog and website. Thank you, Lara, for all you do! I’m finally visiting your blog for the first time after hearing so much about you and finally reading your book! I learned quite a few things from your book that will stay with me…. especially the phrase: “Progress Not Perfection”. That phrase has been going through my mind and has been such a help to me. Thank you for sharing your goals… I love hearing what other people are reaching for this year. Also, thank you for being a great example by saying no to the internet when needed. Balance is so important and knowing y priorities is something I’m still learning! Great goals for the new year! My main goal for this year is to start a big and health garden! I love gardening and this makes me really happy! Last year I tried growing many kinds of vegetables, herbs, flowers and fruits. Everything was great and I ate many fresh veggies! I also want to start homeschooling my son this year! 🙂 Thanks for sharing! Hi Lara! I just wanted to compliment you on the goal worksheets! I ordered mine a couple of weeks ago and I’m absolutely LOVING them! I mean, I really really love them. It is so obvious that you put enormous amounts of thought and heart into this…..very well done!! Goal 1. study the word. Dig deep and be firmly rooted. Goal 2. focus on family. de-clutter literally and figuratively to make space for motherhood, marriage, and being faithful in those things. Goal 3. use my work with Noonday Collection to help build a flourishing world. Donate monthly to a local organization that is creating change for good and support as many adopting families as possible. Lara, this makes me want to dive even more into Jesus. Thank you! I had a few ;life changers recently and I felt so stuck in a rut and slowed anxiety to control my life until. Trying to always be in control of my progress I was forgetting that I cannot do it without God! Reading make it Happen has allowed me to slowly get back in the game by remembering its PROGRESS not perfection. Thank you so much for your inspiration!!! I’m so glad the book encouraged you! Hi! I’m Lara. I’m a grateful wife (we have quite a story! ), mom to three (one through the gift of adoption), and an unlikely gardener. I’m the creator of the PowerSheets grace-filled goal planner, founder of Southern Weddings magazine, and author of Make It Happen and Cultivate. I love living in Chapel Hill, NC. You can learn more about me here! Get My Top 10 Tips for Making it Happen! Success! You are now subscribed to Lara's Newsletter! 2019 GOAL SETTING, Part 1: Let’s get started! PREPARE FOR AN INTENTIONAL SUMMER! GET THE FIRST THREE CHAPTERS OF LARA'S NEW BOOK!